As we conclude our observance of “National Bath Safety Month,” there are a few other considerations, issues, or concerns that we haven’t discussed. We’ve looked at several, but there still are others. We’ve talked about the obvious concerns that stem from the tendency of the flooring and porcelain surfaces to be slippery – especially when wet, those same hard surfaces that exist with the fixtures and the flooring, and the tight spaces that often are present – especially in mid-century homes and others with central hallway baths, the fact that we often are in a hurry or not wide awake when going into the bathroom, and that often we are distracted. Notice that these safety issues are not age or ability related. They apply to everyone. A two-year-old is just as capable of colliding with a hard surface or falling on a slippery floor as a ninety-two-year-old, although the consequences become more severe the older we become. It generally is the physical layout and the size of the space that are the culprits when it comes to safety in the bathroom. This is why it is no respecter of ages or abilities although some people are more prone to having issues in this rather confined space than others. In large expansive bathrooms, floor space is not the issue, but the hard surfaces and low traction generally still are. There are other issues that impact all of us to some extent in the bathroom, again regardless of age or ability and whether we are tall, short, seated, or standing. In many bathrooms the entry door swings into the space. This hampers the available floor area in which to maneuver and is especially concerning in small spaces. Sometimes it opens against a wall sconce, sink, vanity, or toilet to the point where it cannot open fully and much be pushed closed to access those fixtures. Any time that additional motions are required by those using the bathroom, the more opportunity there is for a slip or contact injury. Additional culprits for injuring us from contact with them include exposed drain pipes (the trap) under the sink – the real reason that these are protected with some type of covering to comply with ADA regulations and not to prevent burns because the pipes are only hot when, and for as long as, the hot water valve is opened. Sharp or abrupt corner on the edges of mirrors, medicine cabinets, or countertops can easily leave a mark, bruise, or cut us depending on how hard or forceful we might contact them. We can hit our arms, shoulders, or forehead on towel bars, rings, or even shelving (depending on their distance from the floor and our height) that extends out into the interior passageways in the bathroom. While not as common, we might bump into the water spigot in the tub, the controls on the water valves, slide bars, or anything else mounted on the surfaces inside the shower or tub area even though grab bars are supposed to be helpful. Something that has happened to most people is getting soap or shampoo in their eyes while washing the face or hair. That strong burning sensation is very uncomfortable and a little disorienting. We immediately close our eyes to keep any more of the soap from our eyes, and we attempt to rinse off what is there. With our eyes closed and being in some discomfort, we could lose our footing or walk into something that otherwise would not be an issue for us. 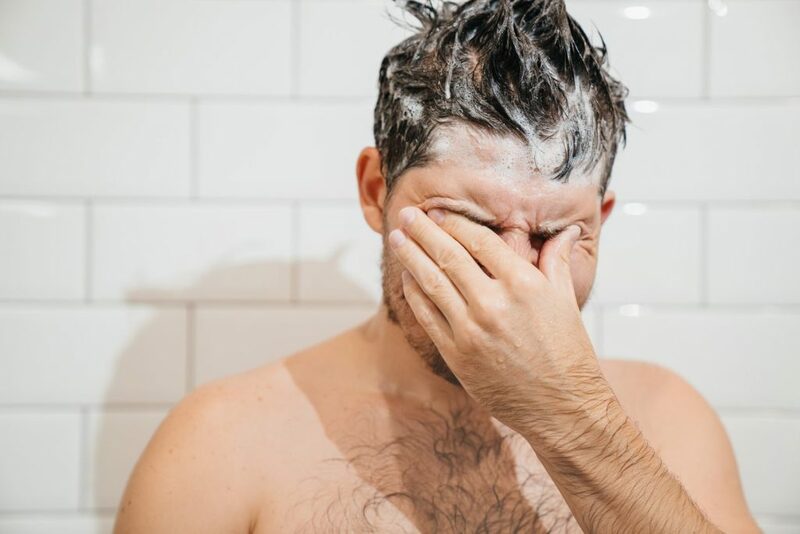 Upon completing our bath or shower, we reach for a towel – a potential slip if we overextend our arms and lean too far – and begin drying our face or hair. Likely, our vision is blocked or obstructed. This is another time when we might slip, misstep, or walk into something. Siting and rising as from the toilet, a bench in front of the vanity, or a seat in the tub or shower (fixed or fold-down) can pose issues for people even without mobility limitations when there is a cramp, dizziness, illness, or sudden weakness. Of course, arthritis and other mobility issues, as well as diminished vision, are going to create issues in bending, lifting, sitting, rising, and standing. Two other concerns are excess heat from running water that has not been regulated (at the water heater or with a thermostatic control) and cuts from razors or scissors that we might use while grooming. The fact that sometimes we do this without our eyeglasses or readers contributed to the safety challenges. As we close the “National Bath Safety Month” observance, we have no shortages of issues, concerns, and considerations to be aware of, monitor, and factor into our assessments and designs for helping our families and our clients age in place effectively and safely.